Plans to turn part of Chichester’s House of Fraser back into a separate shop have been approved by Chichester District Council. Plans for 11 West Street (pictured) requested the space be recreated as an individual property, blocking up the internal connection to the rest of the House of Fraser building at number 12. Listed building consent was required for the works (18/02999/FUL), which also include changes to staircases and the front entrance. Instead of a shop window and separate door, designs show the shop will have a fascia sign across the whole of the shop front and a double door entrance in the centre. It is not clear from the plans which business is expected to move into the unit, which will also have a store and office spaces as well as staff facilities at first and second floor levels. Historic pictures of 11 West Street were included in the application to support the changes. Chichester City Council welcomed the proposals and the Chichester Conservation Area Advisory Committee made no objection. House of Fraser is due to close its Chichester store on January 27. 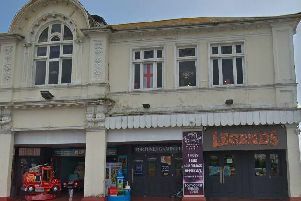 Splitting the former Army and Navy store into smaller units has previously been mentioned by the store’s landlord as one way of re-letting the space.